Implantology recalls the word “implant”, or as close to the natural tooth. A term that also brings with it a sense of strength , solidity and security . It is a technique that allows dentistry to replace missing teeth (from a single tooth to full arches) with fixed prosthesis to the bone of the maxilla and mandible. A titanium screw, high biocompatibility, is inserted into the jawbone and / or lower jaw. In a second step, the dentist will anchor the screw the new tooth, prepared by the prosthetic laboratory. Results and comfort are guaranteed. The intervention can be programmed both in young patients and in those in old age in good health. An alternative to the artificial tooth root, a pure titanium screw inserted into the bone of high biocompatibility. At the end of the integration period of the screw into the bone, the dentist will apply the tooth of new construction prepared in the laboratory. Better appearance: Dental implants imitate all the characteristics of your own teeth. They look and feel like your own teeth because they have been created considering your mouth’s physiognomy. Improved speech: Traditional dentures may not offer a strong fixation to your dental arch that can make you mumble and feel insecure when talking, while dental implants allow you to speak without any worries. 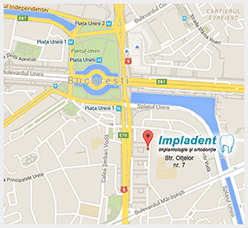 Improved comfort: As dental implants become part of you just as another tooth, they offer a perfect comfort. Eat normally: Some dentures make chewing difficult and avoid you to eat some foods that you like. This does not happen with dental implants, because they work just as your own teeth. Increases your self-esteem: Not just for the image that they offer but for the problems that they avoid, dental implants help you feel better about yourself. Better oral health: They don’t require different hygienic procedures than normal teeth, so you just need to keep up with the same hygienic maintenance. They last longer: they can last lifetime with good care so you won’t have to worry about your teeth anymore. Preservation of bone tissues: unlike other prosthesis, dental implants preserve gum and bone tissues, reducing problems such the loss of jawbone height.